Of all the human facial features, the one that stands out the most is the human eye. I personally think it is because we use them so much as a means of communitcation. We speak with our lips, but we communicate with our eyes. We are drawn to them when we look at other people. When people wear makeup they spend more time working on their eyes than they do any other part of the face. Why am I mentioning this? Because when people look at your portraits they are going to be seeing them as real people and they will be focusing on the eyes more than anything else. Therefore, it is vital that you get the eyes right from the very beginning. I am starting a new set of tutorials today. Each one will focus on a different feature of portrait drawing and will go into detail on problem areas and what do to about them. As we go through them, I want you to keep two things in mind. I talked about them over and over in my lessons creating the Tanna portrait. First; you are not drawing people, you are drawing light and shadow. Second; you are not drawing in three dimensions, so do not look at your source in three dimensions but rather look at it in two. People have asked me time and time again; what is the basic shape of an eye? Well, the absolute honest answer to that is "round." The eye itself is round and that is a very important thing to keep in mind. Now, the eyelids that protect the eye is where you get into different two dimensional shapes. If you whant to draw eyes from scratch, without using a photo or live reference, then there are some basic eye shapes that you can start off with. But, I am not going to talk about them. There are plenty of books and online tutorials that focus on the technical aspects of drawing eye and the correct anatomy to get them right. That is not the purpose of this site. This site is about creating Realistic Pencil Portraits of people that already exist. We are not creating things out of thin air, so we don't need to focus on basic shapes. What we want to focus on is the shape of the subject we are drawing. 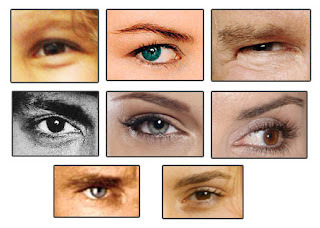 This is an image that I put together that shows a variety of basic eye shapes. I wanted to use it to show you an example of why I am not teaching you a basic eye shape. With so many differences from one person to the next, I don't want you to get hung up on whether or not you got the basic shape right. Over the next few lessons we will be working with a photograph that I took this morning of my wife, Kylie. In this next image I have pointed out a couple of problem areas that people run into when drawing eyes. Below the image I will discuss each of these and a couple of others. Then when we get into actually drawing the eyes with graphite, I will point them out so that you can keep them in mind. Highlights - When most people draw an eye they shade everything and put a single highlight in the iris area, usually partially covering the pupil. 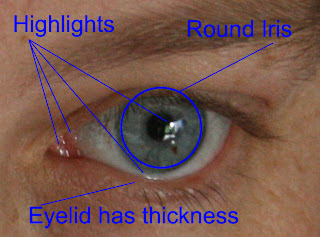 What people tend to forget about are all of the other areas of the eye that have highlights that are just as bright as teh one in the iris, they are just much smaller. Getting these highlights correct is what creates that wet look in your drawing and brings life to the eye itself. Round Iris - Remember earlier when I said that the basic shape of the human eye is round? Well, it is. And so is the iris. Some people tend to draw iris' in more elliptical shapes because that is what they see the entire eye as being. But the reality is that the both the eye and the iris are perfectly round and should always be drawn that way. Unless you are drawing an image of someone who deliberately has there eyes wide open out of fear or surprise, then part of the iris will always be hidden behind one or both eyelids. 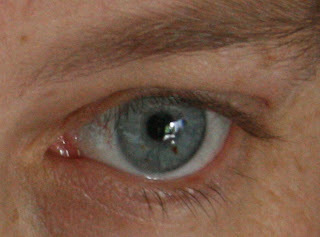 The eyelid has thickness - I can't tell you how many portraits I have seen where people totally ignore this. The eyelid is not like a sheet of paper covering the eye, it has a thickness. In order to depict the eyes as realistically as possible, you must show that thickness in your final drawing. Eyelashes - The eyelash has always been a very difficult thing for artists. In fact, a lot of the old masters completely omitted the eyelashes simply because they were so difficult to get right. This is the advice I am going to give you. Remember that you are not drawing in three dimensions. Do not look at the eyelashes as tiny strands of hair coming out of the eye. Instead, look at them as two dimensional lines that are placed over certain areas of your image. Shadows - A lot of artists tend to ignore the different shadows that are all around the eyes. I think they are afraid to work with it too much. Here is the thing. High contrast in shadow areas is essential. You must put as much focus on the shadows as you do the highlights, it is absolutely vital in getting the results you want. Skin tones - Skin tones tend to scare a lot of people off. A nice smooth blend is easy, but creating freckles or wrinkles or other skin blemishes is a daunting task. I will cover this in a bit more detail when we get to that lesson in the series. For now simply try to remember that you are not drawing freckles and wrinkles, you are drawing values of light. Here is the photo reference that we are going to be using for the remainder of this tutorial. If you click on it you should get a fairly large image that you can use. If you need help in getting the image transferred to your drawing paper, take a look at the post on Creating the Initial Sketch. In our next lesson we will start working on the iris' and discuss the highlight areas in more detail. As always, throughout this tutorial, if you have any questions or need assistance with anything, please comment on the post.